Got any stats showing any correlation to money spent to getting elected? If so how do you account for Kelly? Or do you have to factor in a “no” constant? Craig Kelley deserves a lot of credit for running a successful campaign on a shoestring. The other candidates could learn a thing or two from him. Kelley’s messages at least seem as though he respects his recipients enough to provide details asking them to understand. I don’t know that I ever recall him sending out a message saying what a wonderful guy he is with a list of things he is supposedly responsible for. His messages cost him nothing, but they buy a lot of support. He is one of the few councilors that actually responds to my emails. I’ve “met” Denise Simmons so many times now that each new time she forget who I am I just tell her my name is Gus. Kelley’s performance during the 300 Mass. Ave. block debacle frustrated the hell out of me, however the whole team was the sports equivalent of the Washington Generals during that one, with Maher/Decker the only ones conscious on the floor. 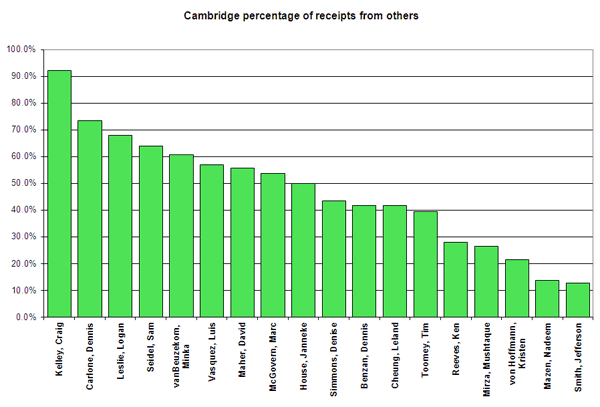 It’s interesting — and instructive — to see who get more than 50% of their money from outside of Cambridge, and who don’t. “Voters might want (if anyone asked) more government support for unions, less price regulation that ensures profits for railroads, or a national health-care plan. But no one asks: voters never get a chance to choose policy directly because all they do is select representatives. And representatives need money to have any chance of winning an election. Thomas Ferguson calls this the “campaign cost condition,” and places it at the center of his theory of the dynamics of American politics. There are two additional aspects of Ferguson’s theory worth pointing out. The first is the claim that competition among moneyed interests is unlikely to solve the problem of access to the agenda. Ferguson calls this the “principle of noncompetition across investor blocs,” noting that “on all issues affecting the vital interests that major investors have in common, no party competition will take place” (p. 28; emphasis added). Jimmy it must be lonely on holy mountain. I also do not think blindly accusing your competition is very endearing though I imagine its the kind of jazz your electorate gets down to. I’ve donated to nearly every candidate running with some obvious exceptions 😉 Some are against what I want, some are clueless, some agree with about half of what I say… I can’t say I expect to get much for my money when I’m looking at a bunch of Democrats who for the most part don’t know their asses from their elbows. But you know what? They’re all good people, and I like a good race. No one among them is selling this city out for a steak dinner, and to suggest otherwise is just asinine. There may be something to Mr. Ferguson’s work on the national stage but it doesn’t fit as neatly in the realm of local city politics, and regurgitating it here like you just discovered cold fusion isn’t really on the level. Good luck in the November showdown. Well, gee, thanks for the kind and generous words! (I love you, too. [:-)]) If you care to know what I really think about the money game, have a look at my “candidate video” at CCTV (and all the others, I might add…): http://www.cctvcambridge.com/candidates Yes, it’s even more pronounced at the state and federal level, I suppose, but are you really comparing yourself to Bruce Ratner?? Right back at ya fella, and I mean that. Im not comparing myself to anyone, I just don’t think blindly accusing your colleagues of selling their souls for a Morton’s steak dinner is appropriate. I don’t have a lot of time to hand out fliers, picket, or answer calls … so the only way I can contribute to the process is by way of money to the candidates I feel will be the best for Cambridge. I don’t expect anything in return, most people don’t, and believe me when I say most of them wouldn’t shake my hand in public. Its a proxy to allow people like me who have two jobs, go to school, and have children to offer some slight assistance to my neighbors who feel compelled to act on their civic instincts. If we were talking national politics and I owned oil fields in Bakersfield and needed a pipeline to Quincy… and donated infinity million dollars by way of superpac to a rep who, against all notions of rational thought, felt compelled to approve said pipeline, then…yes…I can see what you’re talking about. However there is nothing on the agenda in Cambridge that presents such a clear obstruction or would compel my brothers and sisters incumbent or potential to forsake reason in favor of one night at the Mandarin Hotel. I’m just floored that you need nearly 30-50k to be competitive. I would agree with Robert’s assessments of Kelley. Benzan and Carlone are interesting, never heard of either of them and that’s a HUGE amount of money for non incumbents to raise. It will be an interesting race and I look forward to (and greatly appreciate!) the dollar per vote calculation. But we have two seats up for grabs and some weak incumbents so it will be very interesting indeed. Very late itemization of receipts by several candidates (perhaps intentionally) is the reason why there may appear to be discrepancies between the reported totals and the amounts in the itemized reports. I would urge caution in drawing the wrong conclusions about who does and does not get contributions from major real estate interests. For example, I wouldn’t conclude that a challenger is immune from influence just because he has received no such contributions. Incumbents tend to be rewarded after the fact in recognition of their having behaved reasonably. A challenger generally has no such record to warrant that kind of reward. 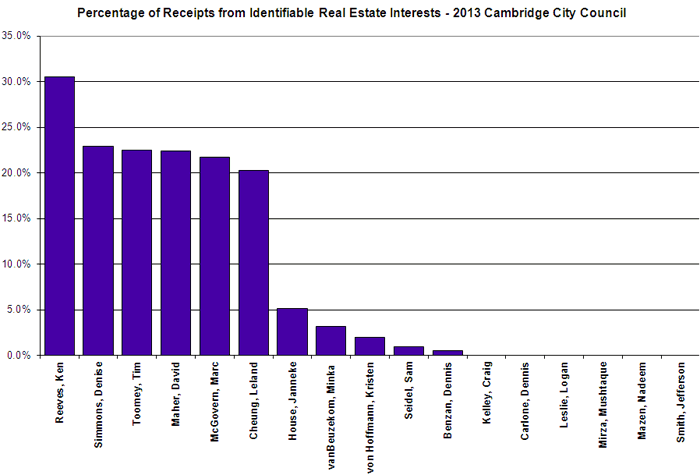 I think it’s also worth noting that there’s a belief among major property owners that elected officials in Cambridge have the potential to be very unreasonable, perhaps even irrational, when it comes anything with political implications. This includes almost anything relating to zoning. In this kind of environment, it’s not hard to see why a property owner or developer might want to write a few checks under the hope that they’ll get treated fairly in a political environment. Generally speaking, I haven’t seen much evidence of any “quid pro quo”. Campaign contributions are more like buying insurance than purchasing influence. I’m a little confused by your numbers and charts. 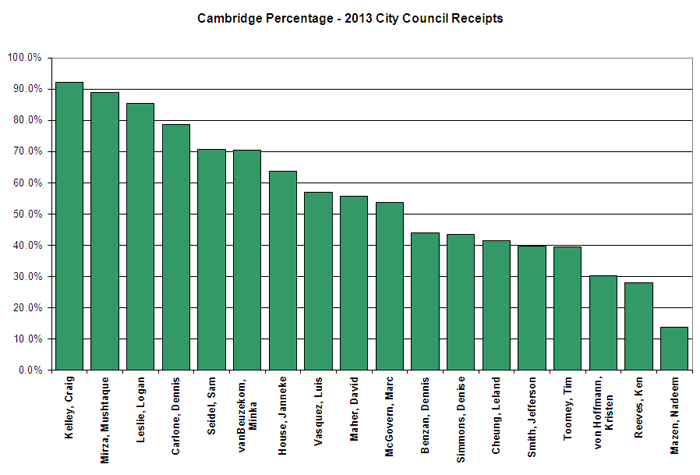 The first chart seems to show the numbers from http://cambridgecivic.com/?p=2660 which are listed as Oct 15 receipts. The Oct 15 numbers are higher than the Oct 26 numbers on this page, why is that? Basically, the bank issues a report twice per month but the candidates still have to supply additional information before it shows up in the itemized reports. Some candidates, most notably Ken Reeves, take a very long time to submit itemized reports. 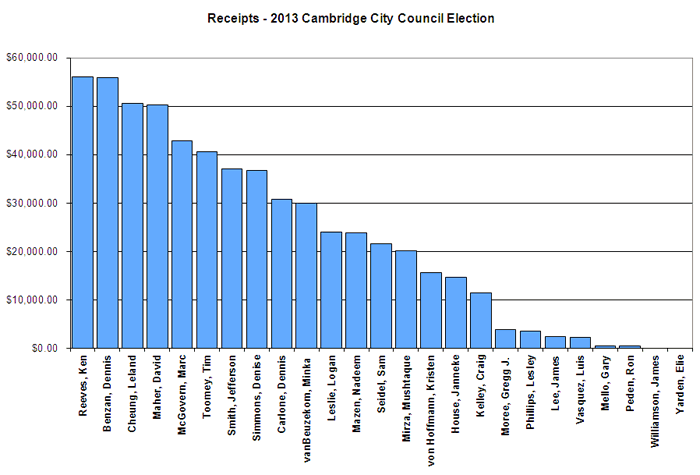 It would be interesting to see the “Cambridge percentage” with candidates donations to themselves removed (if they’re not already). Thanks for doing such a comprehensive job. I was going to do my own analysis, but I’m not sure what I could usefully add to this. Saul – I’ll make a new graph with the candidate loans removed and add it to the others. This, of course, will skew the results significantly in the case of candidates who have chosen to fund their own campaigns. Their money is, after all, also local money. The really interesting campaign finance figures and graphs will only come after the election has passed when excess candidate loans have been repaid to the candidates. That will also be the time to show the expenditures – much of which is spent in the closing days of the campaign on major mailings and robocalls. In summary, he has been making repeated donations to as many as 7 of the current members (with City and State double dipper Tim Toomey leading the way), plus making a new bet on Marc McGovern for this year. It’s all public information and anyone who contributes money to candidates has to know that. I would, however, not jump to conclusions too quickly regarding motive. Mr. Rafferty is himself a former elected School Committee member as well as a true-blue “townie” and it’s not at all surprising that he would make contributions to candidates. I imagine he makes a good income as well, so I would hope that his contributions would be in keeping with what he can afford to give.